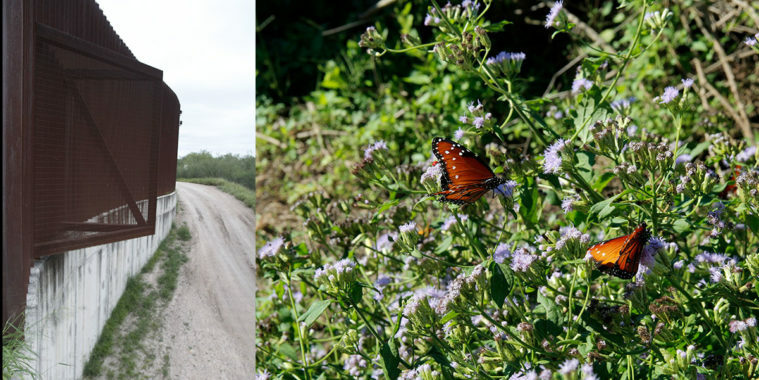 In mid-December, eight Customs and Border Protection (CBP) officials met with the leaders of the National Butterfly Center, a private 100-acre nature and wildlife sanctuary set to be bisected by Trump’s border wall as soon as February. The group met atop an earthen river levee that runs through the refuge, the precise location of the proposed 30-foot wall. In a 2-hour conversation, officials revealed alarming new details about the wall’s environmental footprint and likely impact on tourism. The meeting was a rare opportunity for the refuge’s leaders to question CBP officials, who’ve resisted repeated calls for public forums about the wall — though many questions were left unanswered. As elsewhere in Hidalgo County, the feds plan to remove the southern half of the sloped earthen levee currently running through the National Butterfly Center and replace it with a concrete wall some 15 feet high. Then they’ll top that with 18-foot steel bollards. The lights will tower above the bollards another four to 17 feet. There are also plans for a 150-foot “enforcement zone” south of the wall, which will require the destruction of trees and brush and even structures to make way for patrol roads and ground sensors. The enforcement zone will be lit up all night long, threatening nocturnal wildlife and the center’s economic future. During the meeting, a CBP official promised to provide details about the kind of lighting in early January, but Treviño-Wright says the information still hasn’t come through. Treviño-Wright has been galled by the government’s lack of transparency. Like all landowners in the wall’s path, she’s had a burning question for months: Will CBP install an electronic gate in her section of the wall so she can access the 70 acres of sanctuary left stranded on the south side? After being asked three times during the meeting, a CBP official finally gave an answer: “We’ll inform you if you’re not going to get a gate. … We’re moving forward with the understanding that this is a road that’s important to you, where you want a gate,” he said. But a gate could also cause headaches for the nature sanctuary. In neighboring Cameron County in 2017, a barn with living quarters on the second floor caught fire, south of the border wall built there a decade ago. While the family escaped, four dogs and a goat burned alive. The owner, whose family has farmed in the Rio Grande Valley since the early 1900s, said the fire engines were slowed by the gate in the wall. Treviño-Wright added that the CBP officials haven’t provided her the results of an environmental survey conducted in December, or told her when the agency will begin condemnation proceedings against her land, despite promises during the meeting to do so by early January. The agency will also be removing the butterfly center’s property-line fences to make room for its enforcement zone, an official said during the meeting — an ironic development given Trump’s repeated comparisons between his wall and fences around homes. Throughout the meeting, the officials repeatedly said they were unable to provide more information because the wall designs were only 30 percent complete. It’s unknown if the designs are now further along; since December 22, CBP spokespeople have not responded to requests for comment due to the partial government shutdown. Kate Groetzinger edited the audio for this article.